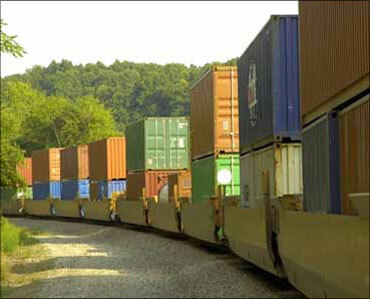 The Ministry of Railways has sat for three months on a strong recommendation of the Planning Commission to redo the supervision of the Dedicated Freight Corridor Corporation of India Ltd.
Montek Singh Ahluwalia, the Planning Commission's deputy chairman, had written to Railway Minister Mamata Banerjee in April that the quality of oversight of the board of directors of DFCCIL left quite a bit to be desired. There was, the letter said, need "to lend greater quality to the deliberations of the board". The Planning Commission, lately in the news for its acidic remarks on the oversight by the road transport ministry of the National Highways Authority of India, would like more independent directors added to the DFCCIL board, Ahluwalia's letter said. This, in addition to having the railway's financial commissioner -- who comes from outside the ministry -- on the supervisory body. There is a provision for appointing four independent directors on the 12-member board of DFCCIL and two of these are presently vacant. Ahluwalia's missive makes clear his unhappiness at the way the DFCCIL has been handling the massive Dedicated Freight Corridor project. The plan was to build an eastern one from Ludhiana to Dankuni in Bengal and a western one from the Navi Mumbai port to Tughlakhabad/Dadri. DFCCIL was incorporated in end-2006 to implement these. His letter notes the estimated project cost has shot up by as much as Rs 20,000 crore (Rs 200 billion) over the Rs 60,000 crore (Rs 600 billion) estimated earlier and seems likely to go beyond, too. "The DFC Corporation seems to expect that this entire amount will be provided through the railway budget. Moreover, the DFC Corporation also expects that all its operational expenses would be paid by the railway ministry. Given the exceptionally large financial implications of this project on the railway's budget, it would be desirable to have the Financial Commissioner on its board," said the letter. 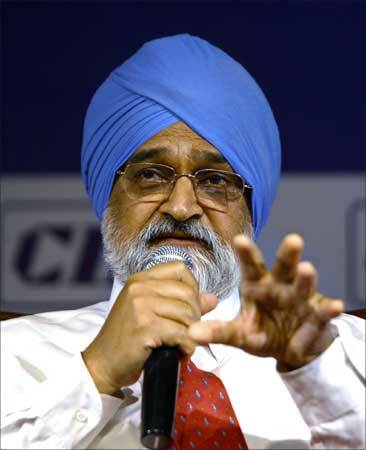 Image: Planning Commission deputy chairman Montek Singh Ahluwalia. There are also considerable time over-runs. DFCCIL had awarded two contracts in December 2008, of Rs 605 crore (Rs 6.05 billion) and Rs 781 crore (Rs 7.81 billion) for construction of bridges on the western and eastern corridors, respectively. Work is progressing only slowly, which would lead to significant time and cost over-runs, states the letter. Not satisfied with the railways' internal monitoring, Ahluwalia had proposed to the railway minister "to conduct a high-level review and assess the current status, which may also be placed before the Cabinet Committee on Infrastructure". The ministry of railways, while seeking approval of the project in August 2006, had said the DFCs would be developed through a mix of public-private-partnership and engineering, procurement, construction (EPC) contracts. 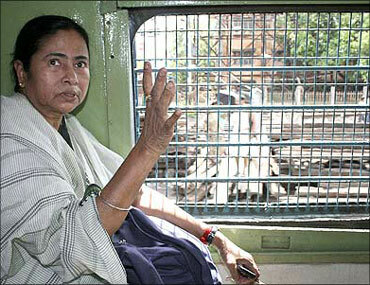 Image: Railway Minister Mamata Banerjee.